The UKC 2015 venue, the Hyatt Regency Atlanta, is located in the heart of downtown Atlanta where fine dining, quality shopping, rich history, and exciting attractions come together in a city full of Southern charm and world-class sophistication. The hotel is a 15-minute drive from Hartsfield-Jackson Atlanta International Airport and offers an indoor connection to the Peachtree Center Station of the MARTA public rail system. Plan a sightseeing tour of Atlanta's best attractions, including the Georgia Aquarium, New World of Coca Cola, CNN Center and Philips Arena, Peachtree Center Mall, Georgia World Congress Center, Fox Theater, Atlanta Civic Center, High Museum of Art, and Turner Field. You can also visit the Georgia Institute of Technology, one of the top research universities in the United States, located in midtown Atlanta. 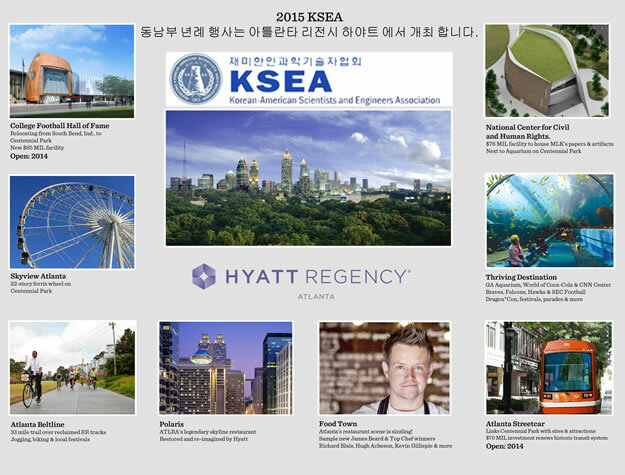 As our location for UKC 2015, the state of Georgia has a population of approximately 100,000 individuals of Korean descent, and the metropolitan area of Atlanta is rapidly emerging as a new Korean stronghold in the southern United States. KIA Motors Manufacturing Georgia, located 80 miles south of Atlanta in West Point, proudly produces more than 300,000 cars (Sorento and Optima) annually. Many quality Korean restaurants and supermarkets can be found in Korean neighborhoods within a 25-mile radius of downtown Atlanta. We hope you will enjoy getting to know a little bit about this burgeoning region of the United States that is home to so many of our fellow Korean-Americans.